The CAFA award was commissioned to recognize and honour the nation’s most promising designers, stylists, image makers, models and business leaders. Designed to embody the creativity of Canadian fashion, this perennial award is a symbol of industry excellence. An original and striking design created by celebrated Canadian industrial designer Karim Rashid, the CAFA Award is a true work of art. Karim Rashid is one of the most prolific designers of his generation. Over 3000 designs in production, over 300 awards and working in over 40 countries attest to Karim’s legend of design. Clear Reflections and Prestige Glass, both Canadian companies, proudly collaborated on the making of the Award resulting in a Canadian made piece of art. This flawless, colourless, and unleaded crystal is a material of permanence and substance. The CAFA logo and personalizations are discretely located on the award, essentially invisible when the award is viewed face-on. 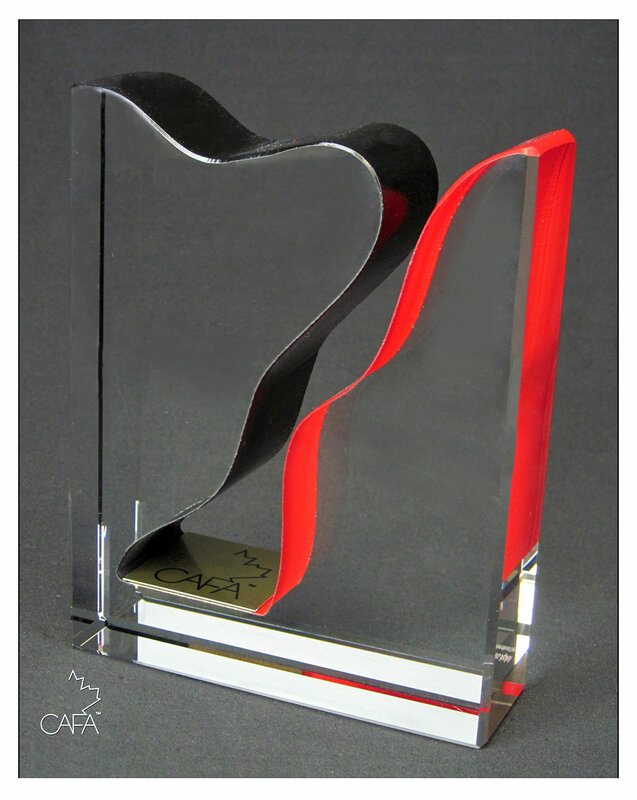 The CAFA award is a freestanding block of pure optical crystal and weighs 5 pounds.